Turnips aren’t a commonly eaten vegetable anymore, but they were once considered a staple. Turnips are starchy root vegetables that grow well in places with cold winters. In fact, turnips actually taste sweeter if they’re harvested after a frost. In fact, ancient people harvested turnips throughout the winter. Without this hardy crop, they probably would’ve gone hungry. Turnips aren’t related to potatoes; they are related to radishes, mustard, and collard greens. 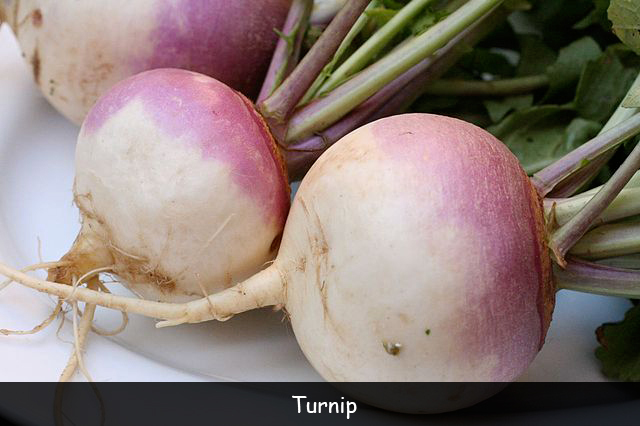 The turnip is a versatile plant. Both its roots and its leafy greens can be eaten. Most turnip varieties have a slightly spicy taste if eaten raw. Most people prefer them boiled, mashed, and served with butter. They are also delicious roasted. Turnips are sometimes grown to feed livestock. Before people carved jack-o-lanterns on Halloween, they carved turnips to frighten evil spirits away during the Celtic holiday Samhain. In the Middle East, people often pickle turnips. Because turnips are so hardy, they were often considered a food source for the poor and needy. Aristocrats refused to eat them. Even today, they’re considered a ‘humble’ vegetable. Question: Can I grow turnips at home? Answer: Yes, especially if you live in Canada or the northern U.S. Turnips grow best in spring and fall in cool climates. They don’t do well during hot, dry weather. Visit Farm Basics to learn more about growing turnips. Learn to make a turnip gratin.